Perhaps you’ve wondered what it would be like to have a powerful and famous family member. What would it be like if your sibling or a parent were the President of the United States? Or a famous athlete? Or some other famous person? It probably would be the source of a certain joy and pride in a good way. At the time Jesus walked on the Earth, He was becoming quite “famous,” so to speak. He was admired and loved and followed by many. And as He was speaking, His mother and brothers (which would have most likely been cousins) showed up outside. No doubt people looked at them with a certain respect and admiration and perhaps even a bit of jealousy. How nice it would be to be Jesus’ actual relative. 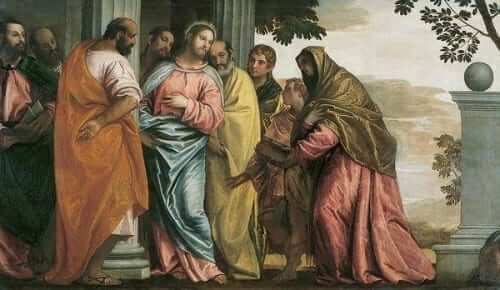 Jesus is quite aware of the blessing of being His own kin, part of His own family. For that reason He makes this statement as a way of inviting everyone present to see themselves as an intimate member of His family. Sure, our Blessed Mother will always retain her unique relationship with Jesus, but Jesus wants to invite all people to share His familial bond. How does this happen? It happens when we “hear the Word of God and act on it.” It’s that simple. You are invited to enter the family of Jesus in a deep, personal and profound way if you but listen to all God says and then act on it. Though this is simple on one level, it’s also true that it’s a very radical move. It’s radical in the sense that it requires a total commitment to the will of God. That’s because when God speaks, His words are powerful and transforming. And acting on His words will change our lives. Reflect, today, upon the invitation of Jesus to be a member of His intimate family. Hear that invitation and say “Yes” to it. And as you say “Yes” to this invitation, be ready and willing to let His voice and His divine will change your life. Lord, I accept Your invitation to become a member of Your intimate family. May I hear Your voice speak and act upon all that You say. Jesus, I trust in You.